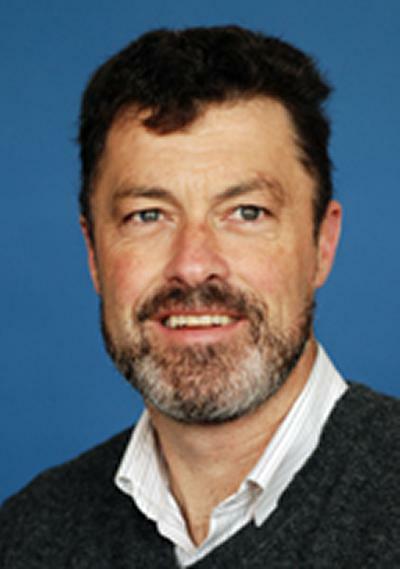 Dr Paul Stoodley is Professor of Microbial Tribology within Engineering and Physical Sciences at the University of Southampton. Dr. Stoodley received his undergraduate degree in Environmental Sciences from Lancaster University and his PhD in Biological Sciences from Exeter University under Professors Hilary Lappin-Scott in Biology and John Boyle in Chemical Engineering. Dr. Stoodley did his postdoctoral training with Dr. Bill Costerton at the Center for Biofilm Engineering in Bozeman, Montana State University (MSU). Dr. Stoodley is currently Lecturer in Microbial Tribology with the National Center for Advanced Tribology at Southampton (nCATS) within the School of Engineering Sciences (SES) at Southampton University in the UK. Previously Dr. Stoodley held the posts of Associate Professor of Immunology and Microbiology and Vice-Director of Imaging at the Center for Genomic Sciences (CGS) at Allegheny General Hospital (AGH), Pittsburgh, USA between 2004 and June 2009, where he maintains Adjunct Professor status. While at AGH Dr. Stoodley worked with clinicians in various medical specialties including general surgery, orthopedic surgery, neurosurgery, nephrology, and cardiovascular surgery on the development of techniques used to diagnosis bacterial biofilms associated with chronic and local infections. From 1999 to 2004 Dr. Stoodley headed the Biofilm Mechanics group at the Center for Biofilm Engineering where he maintains Affiliate Professor positions within the Departments of Microbiology and Mechanical Engineering. Dr. Stoodley serves as a consultant for BioSurface Technologies, Valam Inc., Semprus and Philips Oral Healthcare, where he also serves on the scientific advisory board. Dr. Stoodley is assistant editor of Biofouling journal and is co-organizer of the American Society of Microbiology “Biofilms” conference series. Dr. Stoodley was awarded the 2003 Outstanding Research Award by the College of Engineering, MSU, and a Hanse-Wissenschaftskolleg (HWK) fellowship for collaborative research with Dr. Dirk deBeer at the Max Planck Institute for Marine Microbiology, Bremen, Germany. His research interests include the role of biofilm behavior in progression of infectious disease, biofilm development in environmental ecosystems, biofilm-hydrodynamic interactions, biofilm diagnostics in clinical (medical and dental) specimens and biofilm mechanics and disruption. Dr. Stoodley has published over 100 articles including reviews, research papers and book chapters; he has given over ninety seminars where he has presented his work and various aspects of biofilms to academic, industrial and healthcares audiences. He has been invited to speak at over forty international conferences and seminars including five sponsored lectures for the Philips Oral Healthcare “Emerging Trends in Oral Healthcare” series. Dr. Stoodley has been successfully funded from a variety of US government agencies as well as from industrial. Diagnosis and control of biofilm infections. Mechanical strength of biofilms and removal strategies. Detachment, antibiotic resistance and virulence of emboli from biofilms. Stoodley, P. (Accepted/In press). CORR insights: is implant coating With Tyrosol- and antibiotic-loaded hydrogel effective in reducing Cutibacterium (Propionibacterium) acnes biofilm formation? A preliminary in vitro study. Clinical Orthopaedics and Related Research. Moley, J. P., McGrath, M. S., Granger, J. F., Sullivan, A. C., Stoodley, P., & Dusane, D. H. (2019). Mapping bacterial biofilms on recovered orthopaedic implants by a novel agar candle dip method. Apmis, 1-8. ICM 2018 Biofilm Workgroup (Accepted/In press). The 2018 International Consensus Meeting on Musculoskeletal Infection: summary from the Biofilm Workgroup and consensus on Biofilm related Musculoskeletal Infections. Journal of Orthopaedic Research. Kathju, S., Nistico, L., Tower, I., Lasko, L-A., & Stoodley, P. (2014). Bacterial biofilms on implanted suture material are a cause of surgical site infection. Surgical Infections. DOI: 10.1089/sur.2013.016. Gedge, M., Stoodley, P., & Hill, M. (2014). Minimizing biofouling in microfluidic devices through the use of continuous ultrasonic standing waves. Journal of Ocean Technology, 9(4), 69-89. Arnold, W. V., Shirtliff, M. E., & Stoodley, P. (2013). Bacterial biofilms and periprosthetic infections. The Journal of Bone and Joint Surgery, 95(24), 2223-2229. Costerton, J. W., Post, J. C., Ehrlich, G. D., Hu, F. Z., Kreft, R., Nistico, L., ... DeMeo, P. J. (2011). New, rapid, and accurate methods for the detection of orthopaedic biofilm infections. FEMS Immunology & Medical Microbiology, 61(2), 133-140. Stoodley, P., Wefel, J., Gieseke, A., de Beer, D., & von Ohle, C. (2008). Biofilm plaque and hydrodynamic effects on mass transfer, fluoride delivery and caries. Journal of the American Dental Association, 139(9), 1182-1190. Aspiras, M., Stoodley, P., & de Jager, M. (2008). Sonic brushing and the delivery of fluoride through Streptococcus mutans biofilms. Dental Tribune Asia Pacific, (12), 14-15. Schaudinn, C., Stoodley, P., Kainovic, A., O’Keeffe, T., Costerton, B., Robinson, D., ... Webster, P. (2007). Bacterial biofilms, other structures seen as mainstream concepts. Microbe, 2(5), 231-237. Stoodley, P., Nguyen, D., Longwell, M., Nistico, L., von Ohle, C., Milanovich, N., & de Jager, M. (2007). Effect of the sonicare flexcare power toothbrush on fluoride delivery through streptococcus mutans biofilms. Compendium of Continuing Educationin Dentistry, 28(9 Suppl 1), 15-22. Hall-Stoodley, L., Hu, F. Z., Gieseke, A., Nistico, L., Nguyen, D., Hayes, J., ... Kerschner, J. E. (2006). Direct detection of bacterial biofilms on the middle-ear mucosa of children with chronic otitis media. JAMA: the Journal of the American Medical Association, 296(2), 202-211. Ehrlich, G. D., Hu, F. Z., Shen, K., Stoodley, P., & Post, J. C. (2005). Bacterial plurality as a general mechanism driving persistence in chronic infections. Clinical Orthopaedics and Related Research, (437), 20-24. Ehrlich, G. D., Stoodley, P., Kathju, S., Zhao, Y., McLeod, B. R., Balaban, N., ... Lin, Q. (2005). Engineering approaches for the detection and control of orthopaedic biofilm infections. Clinical Orthopaedics and Related Research, (437), 59-66. Stoodley, P., Dodds, I., De Beer, D., Scott, H. L., & Boyle, J. D. (2005). Flowing biofilms as a transport mechanism for biomass through porous media under laminar and turbulent conditions in a laboratory reactor system. Biofouling, 21(3-4), 161-168. Balaban, N., Stoodley, P., Fux, C. A., Wilson, S., Costerton, J. W., & Dell'Acqua, G. (2005). Prevention of staphylococcal biofilm-associated infections by the quorum sensing inhibitor RIP. Clinical Orthopaedics and Related Research, (437), 48-54. Rupp, C. J., Fux, C. A., & Stoodley, P. (2005). Viscoelasticity of staphylococcus aureus biofilms in response to fluid shear allows resistance to detachment and facilitates rolling migration. Applied and Environmental Microbiology, 71(4), 2175-2178. Sharp, R. R., Stoodley, P., Adgie, M., Gerlach, R., & Cunningham, A. (2005). Visualization and characterization of dynamic patterns of flow, growth and activity of Vibrio fischeri biofilms growing in porous media. Water Science & Technology, 52(7), 85-90. Wilson, S., Hamilton, M. A., Hamilton, G. C., Schumann, M. R., & Stoodley, P. (2004). Statistical quantification of detachment rates and size distributions of cell clumps from wild-type (PAO1) and cell signaling mutant (JP1) Pseudomonas aeruginosa biofilms. Applied and Environmental Microbiology, 70(10), 5847-5852. Post, J. C., Stoodley, P., Hall-Stoodley, L., & Ehrlich, G. D. (2004). The role of biofilms in otolaryngologic infections. Current Opinion in Otolaryngology & Head and Neck Surgery, 12(3), 185-190. Costerton, J. W., & Stoodley, P. (2003). A closer look: the complexities of dental biofilm. Dimensions of Dental Hygiene, 1(3), 36-37. Heersink, J., Costerton, W. J., & Stoodley, P. (2003). Influence of the Sonicare toothbrush on the structure and thickness of laboratory grown Streptococcus mutans biofilms. American Journal of Dentistry, 16(2), 79-83. Stoodley, P., Cargo, R., Rupp, C. J., Wilson, S., & Klapper, I. (2002). Biofilm material properties as related to shear-induced deformation and detachment phenomena. Journal of Industrial Microbiology & Biotechnology, 29(6), 361-367. Stoodley, P., & Howard, K. (Ed.) (2002). Biofilms, smile! You’re on confocal scanning laser microscopy camera. Scientific American, 15-19. Adams, H., Winston, M. T., Heersink, J., Buckingham-Meyer, K. A., Costerton, J. W., & Stoodley, P. (2002). Development of a laboratory model to assess the removal of biofilm from interproximal spaces by powered tooth brushing. American Journal of Dentistry, 15, 12B-17B. Stoodley, P., & Howard, K. (Ed.) (2002). Measuring fluid shear. Scientific American, p.25. Dunsmore, B. C., Jacobsen, A., Hall-Stoodley, L., Bass, C. J., Lappin-Scott, H. M., & Stoodley, P. (2002). The influence of fluid shear on the structure and material properties of sulphate-reducing bacterial biofilms. Journal of Industrial Microbiology & Biotechnology, 29(6), 347-353. Stoodley, P., Hall-Stoodley, L., & Lappin-Scott, H. M. (2001). Detachment, surface migration, and other dynamic behavior in bacterial biofilms revealed by digital time-lapse imaging. Methods in Enzymology, 337, 306-319. Stoodley, P., Wilson, S., Hall-Stoodley, L., Boyle, J. D., Lappin-Scott, H. M., & Costerton, J. W. (2001). Growth and detachment of cell clusters from mature mixed-species biofilms. Applied and Environmental Microbiology, 67(12), 5608-5613. DOI: 10.1128/AEM.67.12.5608-5613.2001. Kommedal, R., Bakke, R., Dockery, J., & Stoodley, P. (2001). Modelling production of extracellular polymeric substances in a Pseudomonas aeruginosa chemostat culture. Water Science & Technology, 43(6), 129-134. Stoodley, P., Jacobsen, A., Dunsmore, B. C., Purevdorj, B., Wilson, S., Lappin-Scott, H. M., & Costerton, J. W. (2001). The influence of fluid shear and AICI3 on the material properties of Pseudomonas aeruginosa PAO1 and Desulfovibrio sp. EX265 biofilms. Water Science & Technology, 43(6), 113-120. Stoodley, P., deBeer, D., & Lappin-Scott, H. M. (1997). Influence of electric fields and pH on biofilm structure as related to the bioelectric effect. Antimicrobial Agents and Chemotherapy, 41(9), 1876-1879. Camper, A. K., Hamilton, M. A., Johnson, K. R., Stoodley, P., Harkin, G. J., & Daly, D. S. (1994). Bacterial colonization of surfaces in flowing systems: methods and analysis. Ultrapure Water, 11(6), 27-35. Lewandowski, Z., Stoodley, P., Altobelli, S., & Fukushima, E. (1994). Hydrodynamics and kinetics in biofilm systems - recent advances and new problems. Water Science & Technology, 29(10-11), 223-229. Stoodley, P., DeBeer, D., & Lewandowski, Z. (1994). Liquid flow in biofilm systems. Applied and Environmental Microbiology, 60(8), 2711-2716. Lens, P., O’Flaherty, V., Moran, A., Stoodley, P., & Mahony, T. (Eds.) (2003). Biofilms in industry, medicine and environmental biotechnology. (Integrated Environmental Technology Series). London, GB: IWA Publishing. Fabbri, S., & Stoodley, P. (2016). Mechanical properties of biofilms. In H-C. Flemming, T. R. Neu, & J. Wingender (Eds. ), The Perfect Slime: Microbial Extracellular Polymeric Substances (EPS) London, GB: IWA Publishing. Hall-Stoodley, L., & Stoodley, P. (2015). An adenoid reservoir for otitis media pathogens. In R. Kania, & B. Ars (Eds. ), Biofilms in Otitis (pp. 253-274). Amsterdam, NL: Kugler. Stoodley, P., Hall-Stoodley, L., Costerton, J. W., DeMeo, P., Shirtliff, M., Gawalt, E., & Kathju, S. (2012). Biofilms, biomaterials, and device-related infections. In B. D. Ratner, A. S. Hoffman, F. J. Schoen, & J. E. Lemons (Eds. ), Biomaterials Science an Introduction to Materials in Medicine. 3rd Edition. (pp. 565-583). Elsevier. Guélon, T., Mathias, J-D., & Stoodley, P. (2011). Advances in biofilm mechanics. In H-C. Flemming, J. Wingender, & U. Szewzyk (Eds. ), Biofilm Highlights (pp. 111-140). (Springer Series on Biofilms; No. 5). Heidelberg, DE: Springer. Costerton, B., Cook, G., Shirtliff, M., Stoodley, P., & Pasmore, M. (2004). Biofilms, biomaterials, and device-related infections. In B. D. Ratner, A. S. Hoffman, F. J. Schoen, & J. E. Lemons (Eds. ), Biomaterials Science: an Introduction to Materials in Medicine, 2nd Edition. (pp. 345-354). California, US: Elsevier Academic Press. Purevdorj-Gage, L. B., & Stoodley, P. (2004). Hydrodynamic considerations of biofilm structure and behavior. In M. Ghannoum, & G. A. O’Toole (Eds. ), Microbial Biofilms (pp. 160-173). Washington, US: ASM Press. Costerton, J. W., & Stoodley, P. (2003). Microbial biofilms: protective niches in ancient and modern geomicrobiology. In W. E. Krumbein, D. M. Patterson, & G. A. Zavarzin (Eds. ), Fossil and Recent Biofilms: a Natural History of Life on Earth (pp. xv-xxi). Dordrecht, NL: Kluwer Academic Publishers. Purevdorj, B., & Stoodley, P. (2003). The role of cell signalling in biofilm development. In P. Lens, V. O’Flaherty, A. Moran, P. Stoodley, & T. Mahony (Eds. ), Biofilms in Industry, Medicine and Environmental Biotechnology (pp. 63-78). (Integrated Environmental Technology Series). London, GB: IWA Publishing. Stoodley, P., & Warwood, B. K. (2003). Use of flow cells and annular reactors to study biofilms. In P. Lens, V. O’Flaherty, A. Moran, P. Stoodley, & T. Mahony (Eds. ), Biofilms in Industry, Medicine and Environmental Biotechnology (pp. 197-213). (Integrated Environmental Technology Series). London, GB: IWA Publishing. Stoodley, P., Hall-Stoodley, L., Boyle, J. D., Jorgensen, F., & Lappin-Scott, H. M. (2000). Environmental and genetic factors influencing biofilm structure. In D. G. Allison, P. Gilbert, H. M. Lappin-Scott, & M. Wilson (Eds. ), Community Structure and Cooperation in Biofilms (pp. 107-127). (Society for General Microbiology Symposium; No. 59). Cambridge, GB: Cambridge University Press. Moore, G. F., Dunsmore, B. C., Jones, S. M., Smejkal, C. W., Jass, J., Stoodley, P., & Lappin-Scott, H. M. (2000). Microbial detachment from biofilms. In D. Allison, P. Gilbert, H. M. Lappin-Scott, & M. Wilson (Eds. ), Community Structure and Cooperation in Biofilms. (pp. 107-127). (Society for General Microbiology Symposium Series; Vol. 59). Cambridge, GB: Cambridge University Press. Roberts, S. K., Bass, C. J., Brading, M., Lappin-Scott, H. M., & Stoodley, P. (1999). Biofilm formation and structure: what’s new? In H. H. Newman, & M. Wilson (Eds. ), Dental Plaque Revisited: Oral Biofilms in Health and Disease (pp. 15-35). (Proceedings of a conference held at the Royal College of Physicians, London, 3-5 November 1999). Cardiff, GB: BioLine. Stoodley, P., Boyle, J. D., & Lappin-Scott, H. M. (1999). Biofilm structure and behaviour: influence of hydrodynamics and nutrients. In H. H. Newman, & M. Wilson (Eds. ), Dental Plaque Revisited: Oral Biofilms in Health and Disease (Proceedings of a conference held at the Royal College of Physicians, London, 3-5 November 1999). Cardiff, GB: BioLine. Stoodley, P., Boyle, J., Cunningham, A. B., Dodds, I., Lappin-Scott, H. M., & Lewandowski, Z. (1999). Biofilm structure and influence on biofouling under laminar and turbulent flows. In C. W. Keevil, A. F. Dow, A. Godfree, & D. Holt (Eds. ), Biofilms in Aquatic Systems (pp. 13-24). Cambridge, GB: Royal Society of Chemistry Press. Boyle, J. D., Dodds, I., Lappin-Scott, H., & Stoodley, P. (1999). Limits to growth and what keeps a biofilm finite. In R. Bayston, M. Brading, P. Gilbert, J. C. Walker, & J. W. T. Wimpenny (Eds. ), “Biofilms: The Good, The Bad, and The Ugly” 4th meeting of the Biofilm Club (pp. 303-316). Cardiff, GB: BioLine. Lewandowski, Z., Stoodley, P., & Roe, F. (1995). Paper 222. Internal mass transport in heterogenous biofilms - recent advances. In Corrosion'95 (pp. 222/1). (NACE Annual Conference and Corrosion Show; No. 95). Texas, US: NACE. Characklis, W. G., Little, B. J., Stoodley, P., & McCaughey, M. S. (1991). Paper 281. Microbial fouling and corrosion in nuclear power plant service water systems. In Corrosion'91 (pp. 281/1-281/21). (Corrosion; No. 91). Texas, US: NACE. Stoodley, P. (2010). Biofilms in the Oral Environment. Invited Lecture. Montgomery-Bucks Dental Society, . Stoodley, P., Nistico, L., Gieseke, A., Kreft, R., Coticchia, J., Burrows, A., ... Ehrlich, G. (2009). Adenoids: a reservoir for pathogenic biofilms. Poster session presented at ASM Biofilms 5 International Conference, . Stoodley, P. (2009). Advanced imaging techniques in biofilm research. International Advisory Board and Chair Person Symposium 4, . Stoodley, P. (2009). Biofilms in the oral environment. International Congress of Oral Implantologists, . Schreiber, F., Stief, A., Gieseke, J. M., Heisterkamp, I., Verstraete, W., DeBeer, D., & Stoodley, P. (2009). Denitrification as a source for nitric oxide and nitrous oxide in human dental plaque. Poster session presented at ASM Biofilms 5th International Conference, . Palmer, R., Moter, A., Sternberg, C., & Beyenal, H. (2009). Imaging and quantifying ex vivo biofilms and flow cell operations. ASM 5th ASM Conference on Biofilms: Biofilms and Flow Cell Operations, . Nistico, L., Gieseke, A., Coticchia, J. M., Burrows, A., Khampang, P., Kerschner, J. E., ... Hall-Stoodley, L. (2009). Pediatric adenoids ecology and otitis media: is biofilm formation the linkage?. Poster session presented at First European Congress on Microbial Biofilms, . Stoodley, P., Nistico, L., Longwell, M., Gieseke, A., Debeer, D., Aspiras, M., & DeJager, M. (2009). Powered brushing and fluoride in a streptococcus mutans typodont biofilm. Poster session presented at International Association for Dental Research (IADR) General Meeting, . Grande, R., Nistico, L., Samanthamoorthy, K., Iannitelli, A., Cellini, L., DiStefano, A., ... Stoodley, P. (2009). Staphylococcus aureus UAMS-1 biofilm development over time: the role of extracellular DNA and carbohydrates in the biofilm structure. Poster session presented at First European Congress on Microbial Biofilms, . Von Ohle, C., Decker, E-M., Rodrigues-Faria, A., Brecx, M., & Stoodley, P. (2009). Substantivity of chlorhexidine in established dental biofilms after mouthrinsing. Poster session presented at First European Congress on Microbial Biofilms, . Dukhin, S. S., Brumlik, C. J., Tabini, Y., Stoodley, P., & Labib, M. E. (2009). The long-term release of antibiotics from monolithic nonporous polymer implant - modeling and testing for use as tympanostomy tube (TT) for the treatment of otitis media (OM). Poster session presented at 13th IACIS International Conference on Surface and Colloid Science and 83rd ACS Colloid and Surface Science Symposium, . Stoodley, P. (2009). The mapping of microbial biofilms in orthopedic infections: a window into etiology. 28th Annual European Bone and Joints and Joint Infection Society, . Stoodley, P. (2009). The role of biofilms in orthopaedic infections. Invited Lecture at Departmental Seminar, Thomas Jefferson University, Philadelphia, . Winston, M., Rupp, C. J., Vinogradov, A., Towler, B. W., Adams, H., & Stoodley, P. (2003). Rheology of biofilms. Paper presented at American Society of Civil Engineers 16th Engineering Mechanics Conference, United States. Stoodley, P., Wilson, S., Cargo, R., Piscitteli, C., & Rupp, C. J. (2001). Detachment and other dynamic processes in bacterial biofilms. In Surfaces in Biomaterials 2001 Symposium Proceedings. (pp. 189-192). Surfaces in Biomaterials Foundation. Stoodley, P., Boyle, J. D., & Lappin-Scott, H. M. (2000). Influence of flow on the structure of bacterial biofilms. In C. R. Bell, M. Brylinsky, & P. C. Johnson-Green (Eds. ), Microbial Biosystems: New Frontiers : Proceedings of the 8th International Symposium on Microbial Ecology (pp. 263-269). Atlantic Canada Society for Microbial Ecology.